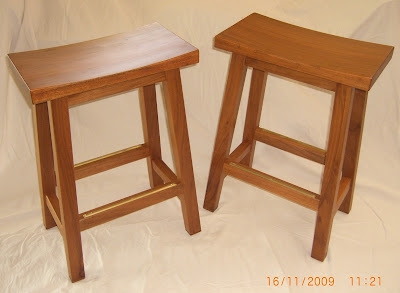 HTML MessageHot out of "The Shed", MDR's latest creation, a pair of Shinto style bar stools, a Christmas gift for PTA & his beloved Mamiko. As usual MDR has lavished a great deal of time - and sweat - to craft these works of art and not one nail has been used. The timber used is Cairns Pencil Cedar, from a tree that was felled in nearby Kamerunga about two years ago. The stools are finished with a clear matt oil based seal, unstained.